The show we got invited to be in, Throwback: Balik Kampong premiered last night! Did you catch it? If you didn't, you can watch it now at this link on Toggle.sg if the embedded video below doesn't work. The kids, Matthew and I, all had a good time watching it last night. It brought back many memories of our time in the kampong and it made us really miss our friends: the crew, the Awads, the Azimullahs and the hosts Rozz & Fuzz. It's our first time watching the show as well, so we were very entertained since we only knew what happened with ourselves but not what was going on with the other two families when we were not together. The kids (and us too, really!) were highly amused at seeing ourselves on TV. So much so that Isaac wasn't even bothered seeing himself crying on TV. During commercial breaks, our phones buzzed continuously with our friends and family making comments over whatsapp group chats, and on Facebook. Over the many ensuing conversations, we received many similar questions about our experience at the kampong. Hence, after each episode, I shall write a post answering questions you viewers may have about the episode. We will answer the questions as best as we can without giving any spoilers nor reveal any stuff from future episodes which has not been aired yet. 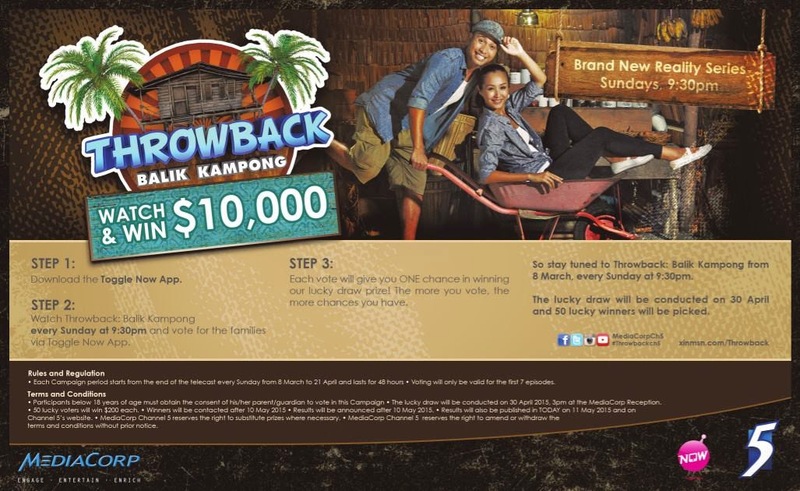 Q1: How did your family come to be involved in Throwback: Balik Kampong? A1: The producers contacted us through the email address provided on this blog to ask if we would like to participate in this. Read more about this in this post. Q2: How long were you there in the kampong for? A2: We were there for more than two weeks. A3: We were only told that we were supposed to stay in a real kampong that is reminiscent of kampongs in Singapore in the 1960s. And that we will not be allowed any of our phones, electrical devices, nor computers with us. Every other question we had was not answered directly. That's why we did not know that everything we brought in our luggage would be taken away from us. Q4: What?! Not a single thing from your luggage was allowed?! Q5: So they provided all the clothes you wore, except for underwear? A5: Yes that's right. I think Matthew was very comfortable in his singlet, as were the kids. Shawna wasn't used to wearing dresses all the time. And me, gosh... I have never worn a samfoo before, and all those flowers!? Never, ever, in my life have I worn such flowery clothing as I did there in the kampong. But I didn't have a choice, we just had to wear what they provide. Hmmm not my best look, I'd admit. And those huge flowers?! Gimme back my black t-shirt!!! Q6: There for weeks, and no phone? What if there was an emergency back home? A5: We gave our family members the Production Director's mobile phone number, in case they needed to contact us. As a safety precaution, we also provided our family's contact numbers to the Production Director, in case anything untoward happens to us at the kampong. Q7: You guys acted very well! You memorise the script the day before filming? A6: Oh no no no, there is no script for the families at all. It is not acting. This is a reality TV show, they only script the events and stuff they want us to do, but the families' reactions and whatever we (and the other families) say is all NOT scripted at all. Q8: Oh so it wasn't in the script for you to let the Indian family choose the house first? A8: No, no, as mentioned, our reactions are all not scripted. Matthew and I didn't really mind either way which house we got, since there were pros and cons for each house. At that time, it was starting to sink in that we were not going to have an easy life in the kampong. It was definitely not a beach holiday as Isaac thought it would be. We were could see that we were going to have a tough time coping with all this ourselves and we have two adults to our three kids. Farzana was going to be handling her three girls herself! So we felt really sorry for The Azimullahs that the girls' father could not take leave to join them at the kampong and this was just a small thing, to allow them to make the choice between the two remaining houses first. Being there in the kampong, just us three families, we spoke a lot to one another. We found out that the Awads were very thoughtful with their choice too. The storm on that first night really scared us and the kids quite a bit as the entire house was shaking because it is entirely made of wood. The din the rain was making on the zinc roof didn't help either. The 2nd and 3rd houses were half wood and half concrete and so were definitely sturdier and were likely not to shake so much during a thunderstorm. Also, in times of emergency if we had to run to neighbours to get help, being the most isolated of the three houses, it would be the furthest one, and a problem for the younger kids. The Awads felt that since they had the oldest kids (Danish & Hannah are 13 this year), they would be able to manage best in that house if the above scenarios arose. It is heartwarming to us, that even though we had only just gotten to know each other for one day, we were helping each other along in whatever way we could. Kampong spirit for the win! Q9: What happened to your voice? Why do you sound so weird? A9: I fell sick the very first day we went to the kampong. I think it was some kind of virus that made me totally lose my voice. Also, it probably didn't help that I didn't get enough sleep leading up to the trip. Slept at 3am packing all our stuff the night before we left. I had tons of phlegm; it was torturous! Furthermore, I had only anticipated the kids getting sick, so we packed a whole mini-suitcase worth of kids medicines, but forgot to pack some for adults! So I had to survive on over-the-counter cough medicine, lozenges, flumicil, and just drink lots and lots of water the entire time I was there. It's a good thing they subtitled me, if not, no one would be able to hear what I was saying! Q10: Poor Isaac! Did he cry the whole time there? A10: Ah hah! You need to continue watching our series to see what happens with Isaac. After the episode aired last night, we had some friends message us saying that THEY felt like crying when they saw Isaac cry. And there was even an 8 year old boy who offered to go stay in the kampong with Isaac to keep him company! We're very touched that there are people who empathise with Isaac. Q11: How were the toilets like, there in the kampong? A11: Ah! From the ad they screened after last night's episode, looks like they're going to show us constructing our own toilet in the next episode! 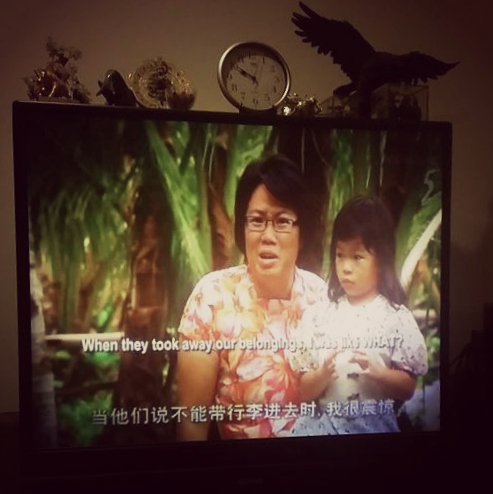 Tune in next Sunday at 9.30pm to Channel 5, to watch Episode 2 of Throwback: Balik Kampong! Q12: Wait! Tell us who the winner will be? Which family won? A12: We don't know! We didn't even know they were going to get the audience to vote. Thus, we suspect that the winner will be highly dependent (if not solely dependent!) on how the audience votes. So YOU people should be the one telling us, who will be the winning family? Go vote for the family whom you think should win! Download the Toggle Now app (not the Toggle app). Details below on how to vote, and quick do it now! Voting lines are only open for 48 hours AFTER each of the first 7 episodes goes on air. Voting for Episode One ends tomorrow on Tuesday 10th March at 10.29pm. Vote on EVERY episode to increase your chances of winning $200! Watch this trailer! If you have any other questions that were not answer in this post, do post them in the comments below in this blog and we can possibly answer them in our next post on Throwback Balik Kampong! Now, go get your voting done, and set an alarm in your phone for 9.30pm on Sunday nights to stay tuned to Channel 5 for Throwback: Balik Kampong! Click on #ThrowbackBalikKampong to read all related posts in this blog. Acknowledgements: Photo and poster above from MediaCorp Channel 5's Facebook Page. It was really entertaining to watch! And really heart-warming. I can almost feel the kampong spirit between the families. Something that is so lacking here as we are all self-sufficient. Well done, kids! Thanks! We found it entertaining as well. When it ended, the kids went "What?! So short!?" Yes, the kampong spirit was strong with all three families, it was great! 1.Will the clothes be kept as Souvenir from mediacorp ? 4. If you ,your husband & your children have to take medicine as you mention you wake up 3am and your voice is gone as you answer in your Question but if you really need to take it , how the producers help you out ? You're my favourite personality from e show so far! !